D.63A. Cambridge, Mass., Harvard University Art Museums, Fogg Museum, no. 946.1933. Pen and ink and brown wash, the wash very faded and only really visible behind the front scrolls of the chariot, 25.7 x 36.2; laid down (?) and with (another?) backing removed around the edges; wm? ; the four corners cut and added; a short tear at the upper center and a long one to the right of center, and two short vertical tears at the lower right, all repaired; creased down the center and across the top; the drawing is stained in several places. 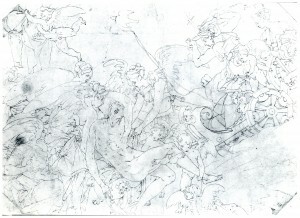 On the verso of the backing, several inscriptions: in the center, in pencil: Raphael, and below this: attribue a Marc Antoine Raimondi beneath which: Mort d’Adonis; also: RB and A2000 [?] (or A over 2 and, separately, 2000); in red pencil: 2 (or A over 2) and Le Rosso above voir les dessins du Louvre; at the right: No.32; Ecole de …[? ]; Ew[? ]; Et; G. Roman; below, in brown ink: J. Cousiny [?] ; at the lower right: Et [underlined]; forect Collon Lenoir [? ]; 135. PROVENANCE: Valori (Lugt 2500); Wauters (Lugt 911); Frederik Muller; Paul J. Sacks. The J. Cousin [?] on the verso could be the first conservator of the Musée Carnavalet in Paris (see under Lugt, Supplément, 432 c-d). Lenoir could refer to Mme Veuve Ph. Lenoir, née Jusserand, whose collection was left to the Louvre in 1874 (see Lugt, p. 345, under no. 1886). Mongan and Sachs, 1946, I, 299, no. 568, II, Fig. 286, as a copy of Rosso’s fresco or of a study for it, and as by Boyvin, according to Kusenberg. Barocchi, 1950, 146, Fig. 139, as a copy by Boyvin of Rosso’s fresco. Béguin, 1966, 58, as Boyvin. Béguin and Pressouyre, 1972, 130, as Boyvin, and related, with variations of details, to Rosso’s fresco. Carroll, 1987, 244, and n. 1, under no. 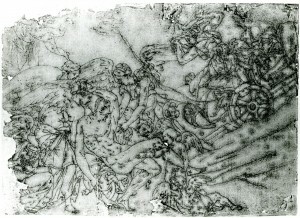 76, as a copy of a lost drawing by Rosso. D.63B. Formerly Dresden, Gasch (dealer). Pen and ink, 26.5 x 37. The drawing is badly damaged, especially at the top and left side where much of the sheet is missing; a tear at the lower left and a few holes here and there; most of the pen lines have bled. Gasch, catalogue, Ackermann Sale, 27-28 April 1911, no. 132; at the Witt Library a note with the reproduction from this catalogue indicates that the reproduction, now filed under Rosso, was formerly kept under Giulio Romano. These two drawings are derived from a lost study by Rosso for his Death of Adonis in the Gallery of Francis I (Fig.P.22, III S a). As discussed in P.22 and in Chapter VIII, the two drawings show exactly the same composition except for two very small details. The cross-bar of Adonis’s couch is not identical in both, but it would seem to be simply mistakenly copied by the draughtsman of the Dresden drawing. 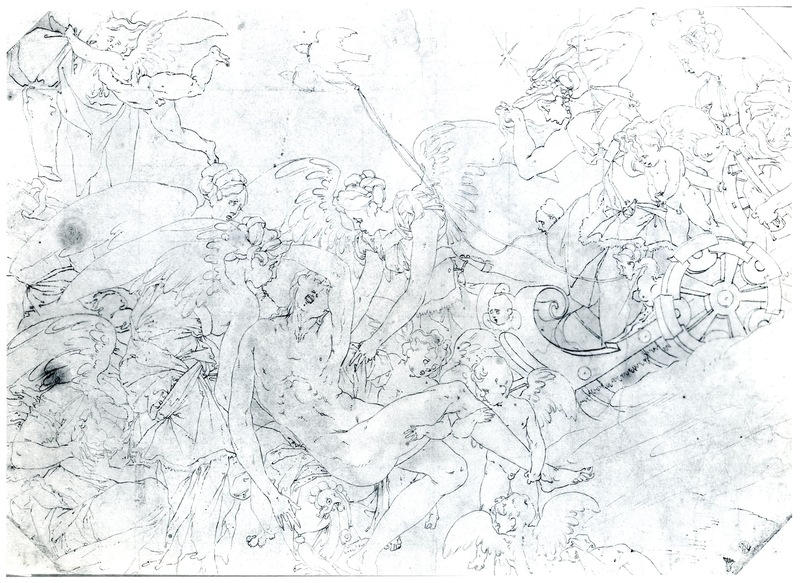 Also, there is parallel shading behind the volute of Venus’s chariot in the Dresden drawing. This may reflect shading, but of a wash and not pen lines. 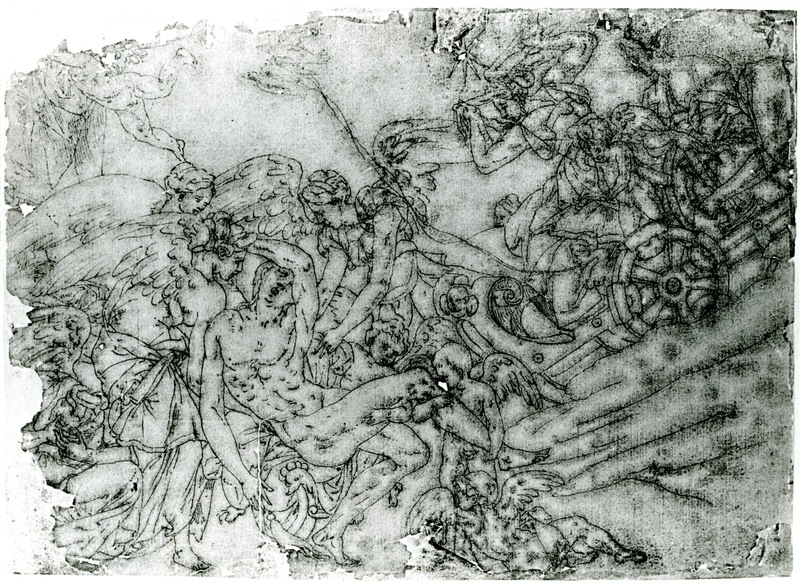 It is in this area that a wash is most evident in the Fogg drawing, suggesting perhaps that the Dresden drawing is copied from it rather than from the lost original. 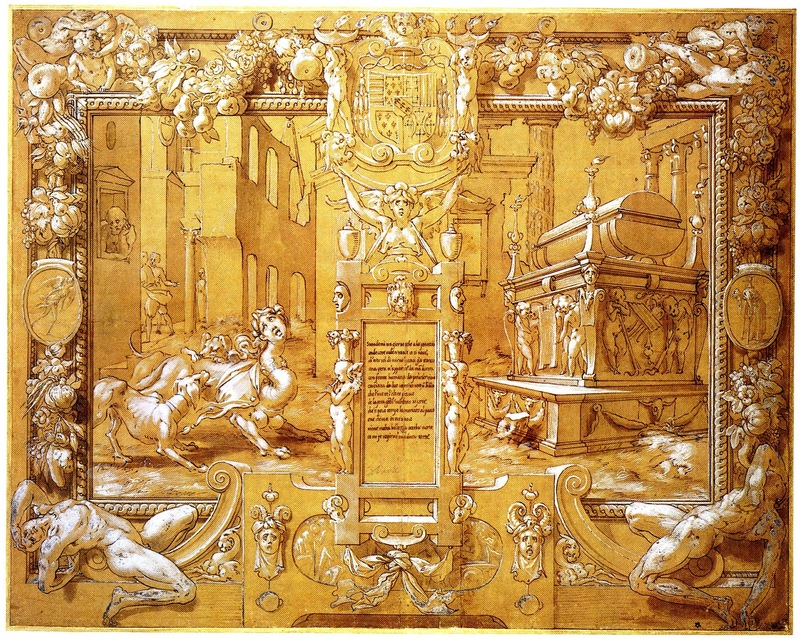 The composition of the drawings differs from Rosso’s fresco in the design of the wheel of Venus’s chariot and of the leg of Adonis’s couch. These differences indicate that the drawings were not derived from the painting. 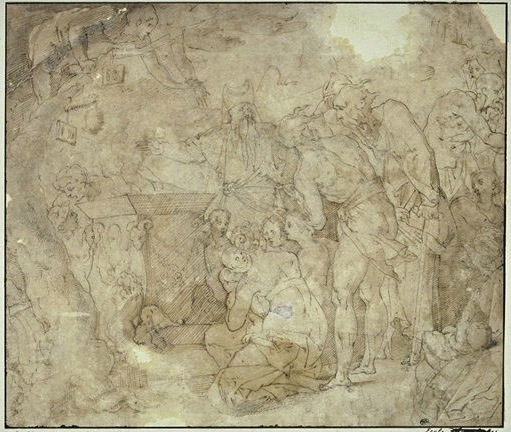 A comparison with the fresco shows, however, that both drawings have been cut at the left and right especially, and, in the case of the Fogg drawing, also at the bottom. 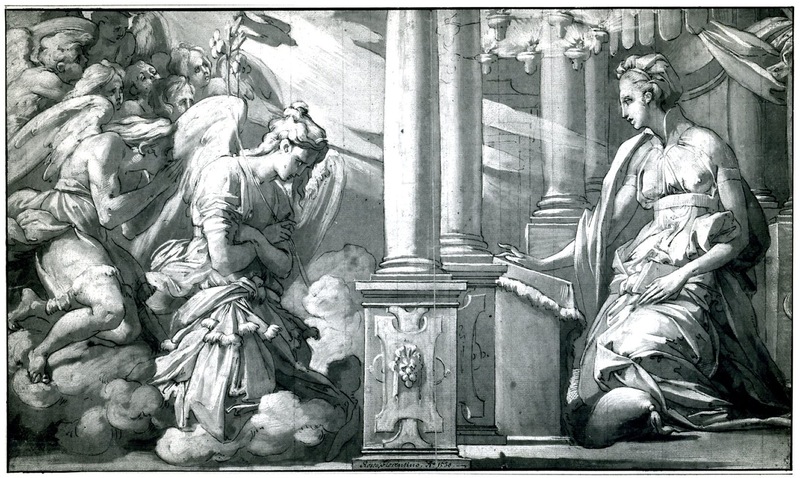 Graphically, both drawings reflect very specifically the kind of penmanship that appears in Rosso’s Annunciation in the Albertina (Fig.D.43a) and his Petrarch drawing at Christ Church (Fig.D.47a), and it resembles the handling of the pen here more than the swifter manipulation of it in the Pandora and Her Box (Fig.D.67a). As copies – for the two drawings are too weak and coarse to be autograph works by Rosso – they indicate a lost original drawing that was very studied in its draughtsmanship. There is, however, no authentic drawing by Rosso that is executed as a line drawing with almost no shading. 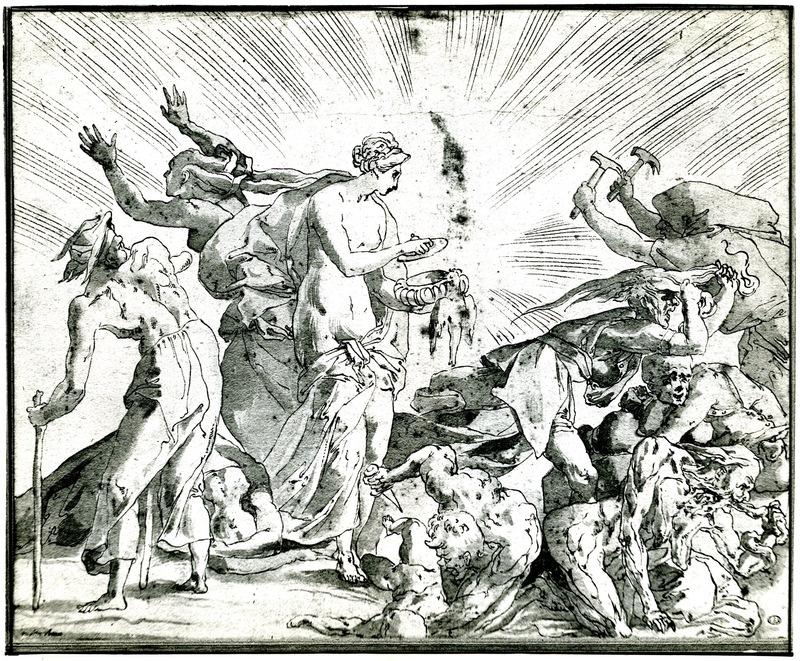 Thus it is likely that the lost drawing also showed the extensive use of washes, which are now only slightly apparent in the Fogg drawing and by the pen hatching in the Dresden copy. But it is also possible that the lost drawing had a dark ground and white highlights like the Annunciation and Petrarch drawings, and like the study, known from faithful copies, for the early version of the Scene of Sacrifice in the gallery (Fig.D.50Ca). 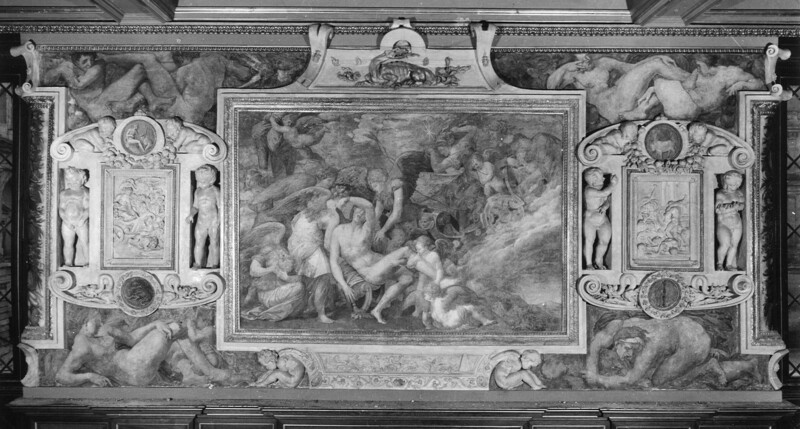 Rosso’s lost drawing would have been done between late August and November 1536 when the composition of the Death of Adonis was designed for the gallery (see P.22). 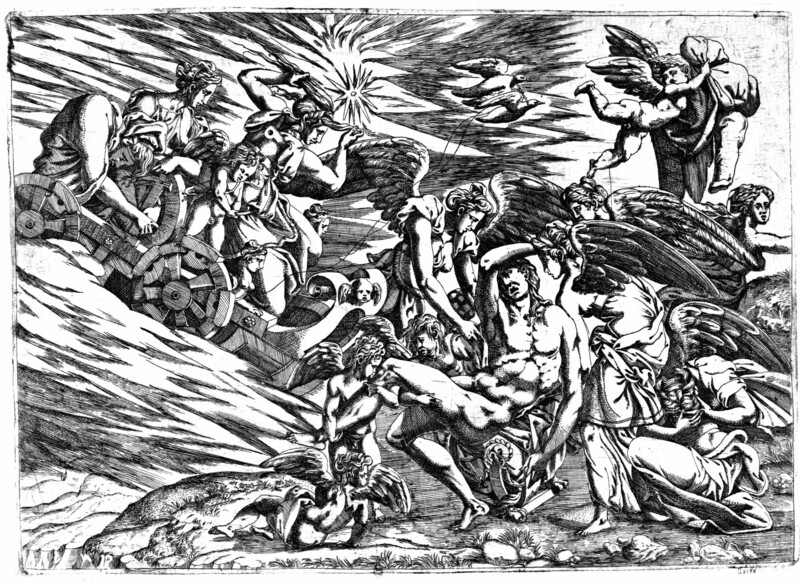 This drawing seems to have been preceded by another from which Fantuzzi’s print was devised (see below). The attribution of the Fogg drawing to Boyvin is not very probable. This engraver never reproduced this scene. PRINT: Fantuzzi, E.76 (Fig.E.76). Etching derived from D.63, or, more probably, from a slightly earlier lost drawing showing a few small differences (see E.76).